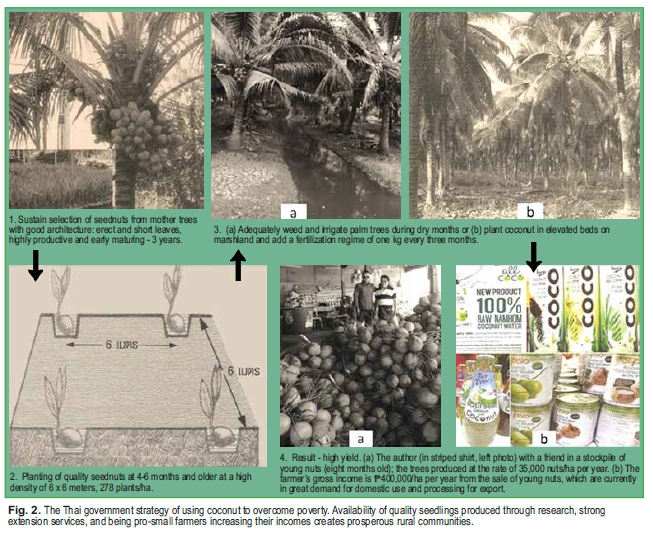 Case studies that provide hope for the Philippine coconut industry. By Pablito P. Pamplona, Ph.D.
Part 1, which discussed the three Philippine government policies that contribute to making coconut farmers poorer—the policy on cutting and replanting old coconut trees, the coconut expansion program policies, and the hybrid program policy—appeared in the January 2016 issue of Agriculture Magazine. Part 2, which discussed the four major reasons for the restoration and expansion of the Philippine coconut hybridization program, appeared in the February 2016 issue of Agriculture Magazine. Hybrid coconut trees produce high yields when provided with adequate fertilization and at times, irrigation. An example is the coconut plantation for the United Plantation Berhad (UPB) hybrids in the province of Perak, Malaysia, which was visited by the author. 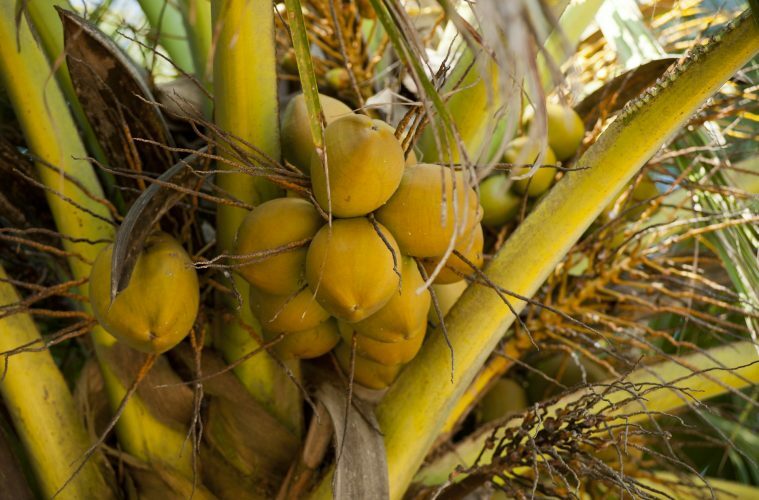 It grows 5,000 hectares (ha) of Matag and other Philippine coconut hybrids. Matag is a hybrid coconut obtained by crossing the Malaysian Red Dwarf and Tagnanan Tall, and was discovered by a team of outstanding Filipino breeders. 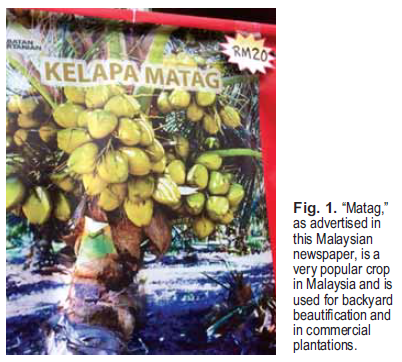 Aside from being grown on a large plantation in Malaysia, Matag is also popular among Malaysian horticulturists and landscapers who promote this hybrid as a resort or home backyard plant for both beautification and food (Fig. 1). Through extensive agronomic field research, UPB discovered that Matag is highly responsive to fertilization in terms of early fruiting and high yield. Flowering comes in less than three years. At full maturity (reached at five years) and onward, the hybrid produces from 29,000 to 35,000 nuts/ha per year or over eight tons of copra. Production costs include the cost of hybrid seednuts, equivalent to R37, and the cost of 24 bags of fertilizer/ha per year or eight kilograms (kg)/tree per year. This brings the cost of fertilization to R33,000/ha/year. The yield of eight tons of copra, at the lowest price of R20, gives the farmers a gross income of R160,000/ha/year. After deducting the cost of fertilizer, their net income comes to R127,000/ha/year. UPB is now contracted by the Malaysian government to produce large quantities of germinated Matag seednuts, which it buys and distributes to small landholders practically for free together with a fertilizer distribution package to ensure that the farmers can achieve incomes above the poverty threshold level.The latest information obtained by the author from a third party is that thanks to research, UPB has been able to reduce the cost of hybrid seednut production to less than R10 per seednut. During the early part of November 2015, the author spent a week in the premier coconut producing provinces of Thailand: Samutsakorn and Ratchaburi. Several times, he visited these provinces before documenting what he now considers as the most successful coconut production program for overcoming poverty. During his last visit, he documented the low-cost and modern irrigation system being used in the over 150,000 ha planted to special coconut varieties, particularly the sweet, and sweet aromatic, coconut. Thai farmers planting coconut seedlings use superior genetic material produced through research; these materials are planted in isolation at least 50 meters from traditional coconut trees. A technique of replanting tall coconut trees at 25 years old without disrupting production and income was developed and adopted by farmers. Adequate weeding, fertilization and irrigation during the three to four month dry period brings coconut trees to high productivity within three years, with yields at the full maturity of the tree in five years at over 33,000 nuts/ha per year. This gives farmers a net income of over R300,000/ha/year (Fig. 2). Their major expense is the purchase of 22 bags of fertilizer at a cost equivalent to R30,000. The coconut farmers in these provinces transitioned from poverty 20 years ago to what is now prosperity. Government support, the use of modern agricultural science, and the farmers’ own industriousness are to be credited. Adequate government support for product development and marketing gave rise to a high demand for their world-class products in Europe, North America, Malaysia, Australia, Singapore, Taiwan, Hong Kong, and soon, even the Philippines under the auspices of the ASEAN Economic Cooperation or AEC. The irrigation technique can be applied to hybrid coconut production and in many places of the Philippines like in the fertile coastal plains and those with distinct dry periods in the Visayas and Northern Luzon, provided irrigation water is available during summer. 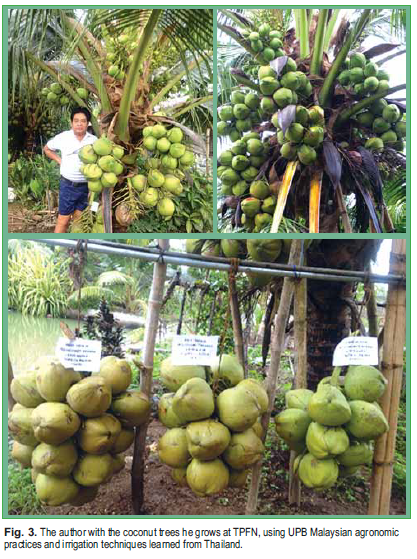 varieties give rise to high yields at TPFN, Kabacan, Cotabato To evaluate the applicability of UPB Malaysian agronomic practices to the coconut hybrids in Mindanao, this author conducted several experiments at Triple P Farms and Nursery (TPFN) in Kabacan, Cotabato. The Matag and special coconut trees were provided with adequate weeding, fertilization, and irrigation, similar to what is done in Thailand during the dry months. He got similar high yield results—at times higher than what UPB gets—after almost four years of adequate weeding, fertilization, and irrigation during the dry months. 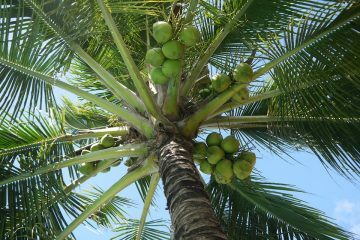 In these experiments, the hybrid and special coconut treesmature in less than three years, and at five years, the coconut trees produce, on the average, 220 nuts/tree/year (Fig. 3) or 35,000 nuts/ha/ year. Today, when Filipino coconut farmers visit their farms and look at the low yielding tall coconut trees, they see the source of their poverty. They either abandon the farm or find hope in other crops—usually the intercrops—as a potential source of prosperity. Thus their farming activities are now focused on intercrops such as cacao, banana, and fruit trees. They increasingly neglect the coconut trees, denying these weeding, fertilization, irrigation, draining of excess water, and so on. This contributes further to the decreasing coconut yield level and the shrinking of the coconut industry. I recently met a coconut farmer and asked him where he got his many cacao seedlings, which were more than enough to intercrop with his coconut. His answer? The “Philippine Cacao Authority or PCA.” (The correct meaning for PCA is the Philippine Coconut Authority.) This is a symptom of the diversion of interest in coconut lands, not only among farmers but also among those who determine the destiny of the industry itself. This discussion shows that the prosperity of a coconut farmer can still come from the coconut tree: the tree of life. Making coconut a tree of prosperity should begin with the repeal of current government policies contributing to decreasing coconut yields that result in an increase in poverty rates. The government should focus on policies and programs that can bring about an increase in the yield of coconut (and consequently, farmers’ incomes) to overcome poverty. 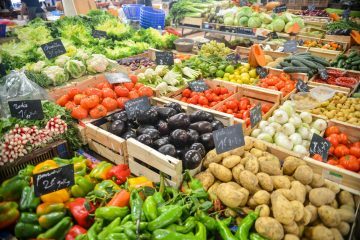 This will help develop a vibrant and prosperous rural economy, and the country can enjoy a more abundant source of food for domestic use. The excess can be shared in the form of vegetable oil exports to the world. Then the coconut industry and the Philippines can be great again. 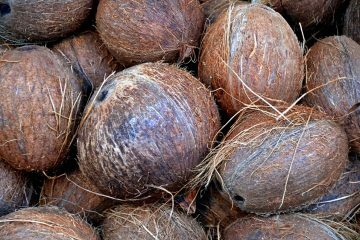 adequate fertilization and the use of Green Revolution crops can bring about the same results with coconut. To achieve this, the government should revise and implement the policies which are pro-farmer. 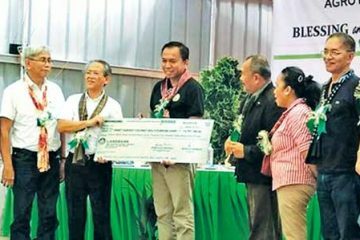 The Philippine government should provide the resources and appropriate strategies to bring back Green Revolution crops into the mainstream of the coconut industry. 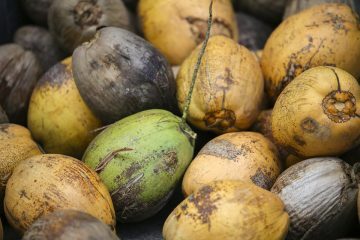 Through the PCA, it should come up with a strong hybridization program,encourage research aimed at increasing the potential yield of Philippine coconut hybrids, and engage in the mass production and distribution of hybrid seednuts. The government should encourage, assist, and provide incentives to the private sector for it to engage in commercial hybrid seednut production similar to what is done with oil palm and coconut in Malaysia and Thailand. It is recommended further that the Department of Science and Technology (DOST), Department of Agriculture (DA), PCA, and other concerned government agencies pool their efforts to revive the coconut industry and transform it from a surviving to a thriving industry. There is a need to develop high caliber scientists who can push upward the biological and economic yield of coconut. Manpower development, infrastructure support, and funds are needed to bridge the gap between the potential and actual yield of coconut, similar to what is being done in UPB Malaysia. It is recommended that a large portion or the whole of the coconut levy fund be used for this purpose.